UPDATE: just received the following comment from shoop’s. apparently vegan diners should order sandwiches on the baguette. be sure to double check that your bread is vegan when ordering. Hi! I’m from Shoop’s. And yes, we do our best to accommodate all of our vegan customers. I just wanted to clarify about the bread. The above pictured sandwich is on a baguette, which is vegan. It’s the Foccacia which has an egg wash. We also have a great German multigrain bread. Thanks for the review!! 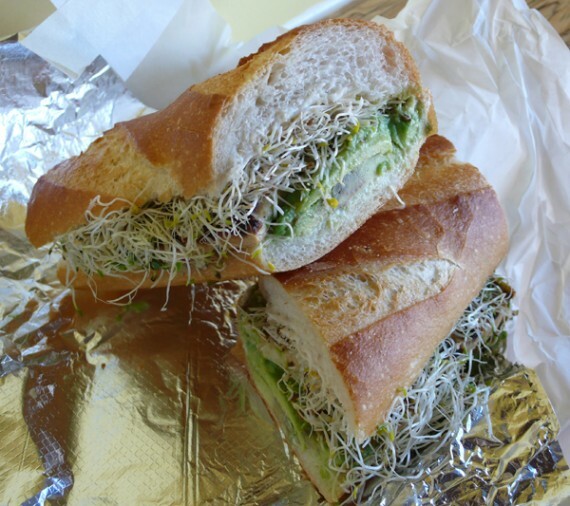 located on hayworth right at santa monica blvd in weho, shoop’s is a modest hole in the wall shop with an impressive menu of breakfast items, wraps, hot and cold sandwiches, soups and salads. but the place is so tiny and tucked away, that if you didn’t know it was there you would totally miss it. while shoop’s is by no means a vegan mecca and i wouldn’t suggest herbivores make a special trip there, it has some great animal-free selections. when i hit up shoop’s a few weeks ago, the owner was working behind the counter. she was super-friendly and willing to answer all my questions about which menu offerings contained animal products. in fact she told me she used to be a vegan herself, and warned me not to order my sandwich on the baguette (egg wash), nor to order anything with soy turkey (egg whites). i knew i was in good hands. she also told me that for vegans, shoop’s would be willing to sub tofu and vegan mayo on any sandwich…so feel free to modify. 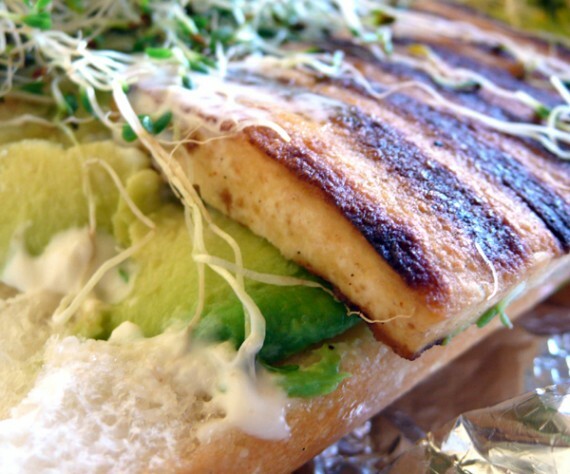 i wound up ordering timber’s tofu filet on focaccia bread, a hot sandwich stacked with grilled marinated tofu, avocado, roasted peppers (which i left off), sprouts and vegan mayo. this sandwich was simple, but really excellent. the bread was extremely high quality, crunchy and fluffy stuff—shoop’s obviously doesn’t cut any corners—and the grilled tofu was tender and deliciously marinated. the owner even made a remark to me that she thought their tofu was better than most places because shoop’s doesn’t “just soak it in soy sauce.” i don’t know what they do marinate it in, but it was tasty. as i was packing up the second half of my sandwich (it was way too big to eat in one sitting), the owner brought me a small cup of lentil soup. she explained that shoop’s daily soup is almost always vegan, and i should try it out. 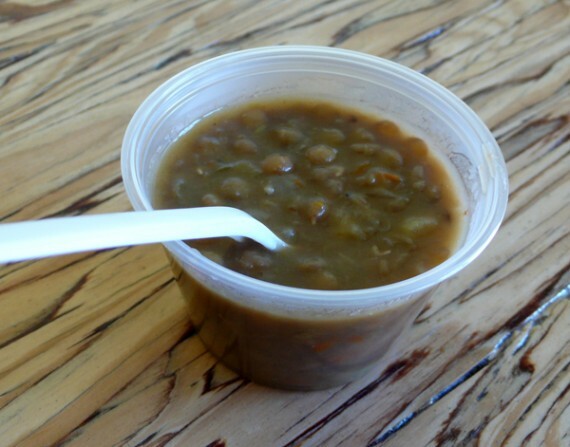 yum…thick and hearty with soft lentil chunks, this thing really hit the spot. while there isn’t a huge vegan selection at shoop’s, it’s nice to know that there is a sandwich shop willing to accommodate us. the place is SUPER vegetarian-friendly, so maybe if we bother them enough they will switch to a brand of soy turkey that doesn’t have egg whites in it! just remember, get your sandwich on focaccia NOT a baguette! ….and order it with fruit, the coleslaw isn’t vegan. oh oh oh, and they have a santa monica location too!